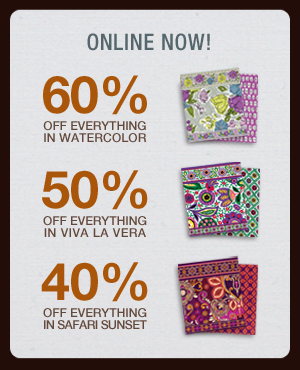 Great sale going on now at verabradley.com! Save 60% off Watercolor, 50% off Viva la Vera and 40% off Safari Sunset. The best deal is a Watercolor Tote for $19.60, plus you get a free Small Cosmetic! Not sure how long the sale will last, so shop now! Is there a code for the free small cosmetic? I don't see that offer in my email.